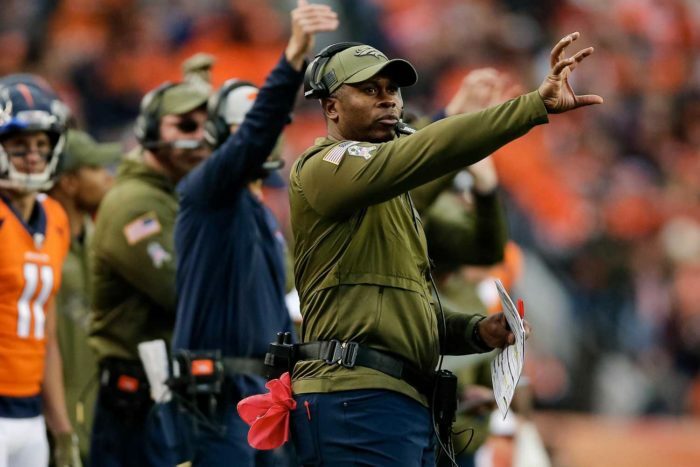 Denver Broncos head coach Vance Joseph admits he got “greedy” after sending K Brandon McManus out to attempt a 62-yard field goal with 22 seconds remaining in the first half Sunday against the Houston Texans. The Broncos were chasing a three-point deficit when they faced a fourth-and-9 at the Houston 44. Joseph wanted to tie the game and begin the second half going for the lead; instead he helped the Texans expand their lead. It seems a little outlandish to send a kicker out for a 60-plus-yard attempt unless the game is on the line. Sure, it was in the high altitude of Denver, but McManus’ career long is 57. Still, McManus has been solid all year and has received praise from his teammates. Case Keenum claimed “he’s the best kicker in the league” and Von Miller said “from 62 and 51, [his] money’s on Brandon.” There were only 22 seconds left in the half, but Joseph’s risky call failed to take into consideration that Houston still had all three of its timeouts. Rather than play it safe and go into halftime with a three-point deficit, Joseph gave the Texans a window of opportunity. Perhaps the risk was necessary in Joseph’s eyes. Though the season is now just past the halfway mark, the Broncos’ playoff picture is vanishing quickly with six teams ahead of them in the AFC and four of their next seven games against teams above .500. The risk could have also been attributed to the offense’s struggle to get any sort of momentum going. Their first score came on a field goal, but only because they were set up with good field position. Their only trip to the end zone in the first half was thanks to a 44-yard pass to TE Matt LaCosse. Joseph can’t say these things to the media, but it’s more likely he wouldn’t have risked the FG try if the Broncos were 5-3 instead of 3-5. When McManus missed the FG attempt, Houston had a short field with all three timeouts left. Even with only 22 seconds left, the situation was manageable. The Texans started on the Denver 48. Two quick passes gained 20 yards; the Texans called their second timeout at the Den 28. To pour salt on the wound, Joseph called a timeout to “ice” kicker Ka’imi Fairbairn, just as he was leaning into his kick. That kick missed, but it didn’t count because of the timeout. After Fairbairn’s next attempt split the uprights, the Texans went into halftime with a 16-10 lead. The Broncos defense held the Texans to just a field goal in the second half, but it wasn’t enough. Denver closed to within 19-17 — and got in position at the end of regulation for McManus to attempt a reasonable potential game-winning field goal of 51 yards. McManus’ kick again was no good — but it might not have been necessary had the Texans not been given the chance to kick their last-second field goal in the first half. Joseph’s decision to attempt the longer field goal at the end of the first half remains our Situational Call of the Week, though there are others who would point to questions regarding the play-calling that set up the final field-goal attempt. After a 5-yard completion to Jeff Heuerman o first down, the Broncos shaved 30 seconds off the clock before RB Philip Lindsay ran for a 1-yard loss. Again the result magnifies these play calls, but had offensive coordinator Bill Musgrave been more efficient with his play-calling, it may have set up an easier kick.